These were originally released in 1998 in 2 different box sets. They stand about 3 inches. Each set came with 4 figures and a ring/cage. 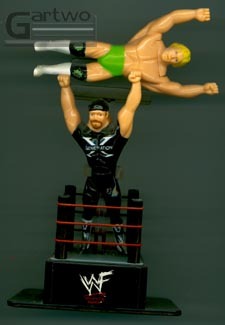 The original 8 figures were: Michaels, HHH, Austin, Kane, Undertaker, Goldust, Shamrock, and Kurrgan a.k.a. The Interregator. 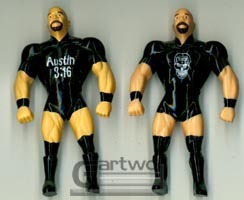 Later these figures were re-released in 2-packs that included various "action" rings. 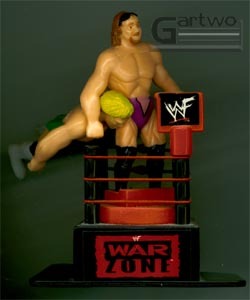 Some new figures also began popping up in these 2-pack assortments: The Rock, Edge, X-Pac, Gangrel, Val Venis, Road Dogg, Billy Gunn & a repainted Steve Austin. This ring was released with unique figures that had both of their arms raised. I am currently looking for any MicroBendems with their arms raised. If anyone has any they'd like to sell or trade, please let me know. Pictures of the other rings coming soon!